Turn your workspace into an exquisite island retreat with the kathy Ireland Office by Bush Furniture Volcano Dusk Collection. This spacious Lateral File Cabinet boasts a flared design at the top, along with family-friendly rounded edges and corners. 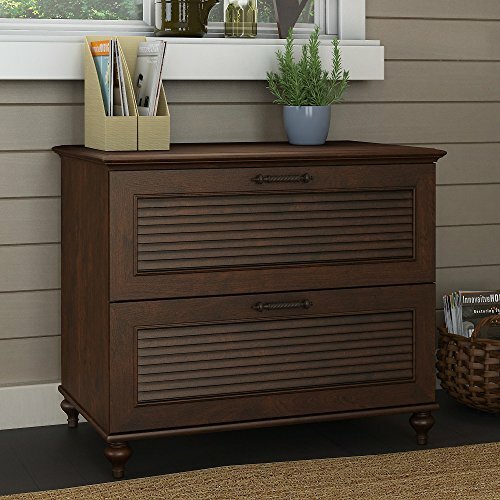 Featuring plenty of storage for your files, the kathy Ireland cabinet offers beautiful hand-painted details, louvered drawers and decorative bun feet. Elegant Antique Bronze hardware accents the attractive Coastal Cherry finish. Two expansive file drawers glide on smooth full-extension ball bearing slides for an easy reach to your documents, even those all the way in the back. The drawers accommodate letter, legal and A4-sized files to help you organize your workspace. With casual elegance and free-spirited contemporary style, Volcano Dusk makes a fashion statement in your home office inspired by the exotic allure of Hawaii. Build a beautiful, functional and comfortable work environment while celebrating island living with a relaxed, tropical-infused look. See the full kathy Ireland Office by Bush Furniture Volcano Dusk Collection for coordinating items available to expand your space with desks, storage and more. This durable construction comes with a 3 Year Manufacturer's Warranty and features Bush Furniture's Quick-to-Assemble(TM) technology to make assembly a breeze.